Fox News reporter: Unite the Right white nationalists "peacefully exercised" free speech while counter-protesters were "chaotic"
Fox & Friends Sunday’s only coverage of the August 12 white supremacist rally in Washington D.C. mentioned only that “tense protests” were expected in Washington, and focused largely on an alleged “antifa mob” in Charlottesville, VA. August 12 marks the one year anniversary of a violent white supremacist rally in Charlottesville, during which an attendee with white supremacist and neo-Nazi ties allegedly drove a car into a group of counter-protesters, killing one woman, Heather Heyer. White nationalists have planned to mark the occasion with a rally in Washington, organized by the same white supremacist responsible for Charlottesville. The only other mention of the Charlottesville rally during the show came when Fox host Martha Maccallum previewed what Fox News Sunday would cover -- she also failed to mention that white supremacists were rallying in D.C. this weekend. Fox’s decision to castigate anti-racist protesters without mentioning that white supremacists are once again rallying on our streets comes as little surprise to anyone familiar with the network’s coverage of the violence in Charlottesville. Following last year’s rally, Fox & Friends Sunday defended white supremacist protesters, with host Pete Hegseth arguing, “there’s a reason those people were out there.” A Fox contributor, Charles Hurt, contended that, “there are those instigators on both sides of this fight that was going on in Charlottesville.” President Donald Trump's remarks defending neo-Nazis after Charlottesville were even full of right-wing media talking points. 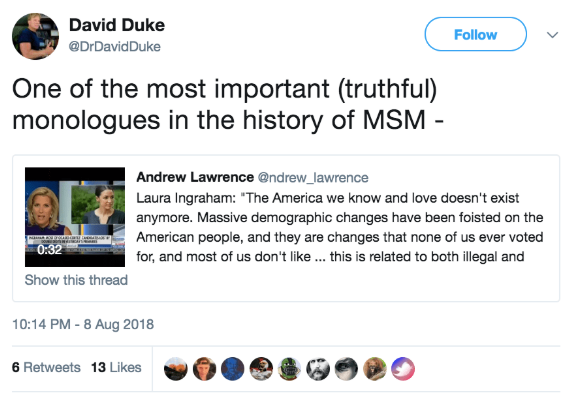 In fact, Fox’s coverage of neo-Nazis marching in Charlottesville was infinitely more sympathetic than their coverage of protesters rallying for gun control or sports players kneeling in protest of racial inequality. Fox News’ Laura Ingraham has drawn widespread rebuke following a racist anti-immigrant rant on the August 8 edition of her Fox show. During her far-from-subtle diatribe, Ingraham bemoaned “massive demographic changes, … changes that none of us ever voted for, and most of us don't like,” and complained, “In some parts of the country, it does seem like the America that we know and love doesn't exist anymore.” Later in the program, she questioned whether “Black-on-Black” crime is a larger issue for the Black community than the racism that infects the criminal justice system. Her comments are a nearly perfect parallel of the rhetoric used by white supremacists and were embraced and commended by former KKK leader David Duke. Outside of white supremacist circles, however, politicians, activist groups, and other media figures widely condemned the rant. Following the criticism, Ingraham defended her comments, arguing that the goal of her monologue was “to point out that the rule of law, meaning secure borders, is something that used to bind our country together.” Ingraham’s deflection, however, is disingenuous and undermined by her history of racist commentary and anti-immigrant rhetoric. Her Fox News show, The Ingraham Angle, is less than a year old, but Ingraham has already turned it into a racist, extremist cesspool. Ingraham has spent years demonizing and mocking immigrants. She hosted John Lott, president of the conservative Crime Prevention Research Center, to defend his debunked report alleging that undocumented immigrants in Arizona commit more crimes -- and more dangerous crimes -- than other Arizonans. Ingraham compared DACA protestors to “wild dogs” and attacked DACA recipients who serve in the U.S. military, saying, “This is the American military. This is not the military of mercenary illegal immigrants!" In 2014, she derided Michigan Republican Gov. Rick Snyder's plan to attract skilled immigrants to work and live in bankrupt Detroit, saying "we can then wall off Detroit" to keep those immigrants from moving to other parts of the country. Later that year, she referred to the thousands of unaccompanied children fleeing from violence in Central America as “an invasion facilitated by our own government." Ingraham has demonstrated particular vitriol for Muslim people, especially immigrants and refugees. On The Ingraham Angle, she questioned White House chief of staff John Kelly about why Trump is bringing in so many "Islamic" refugees. She questioned why "the Muslims" are "never supporting the conservatives on" anti-LGBTQ initiatives. Ingraham is routinely dismissive of any language that is not English and frequently demeans languages spoken by immigrants. She claimed multilingual schools make "you think you're in a foreign country." She mocked MSNBC's Jose Diaz-Balart for translating for a Spanish speaking guest. Ingraham attacked a person who was protesting deportations for speaking with an accent. She compared someone reciting the Pledge of Allegiance in Arabic to a “skinhead” reciting the pledge and argued that “most people who love this country love it enough to speak” English. 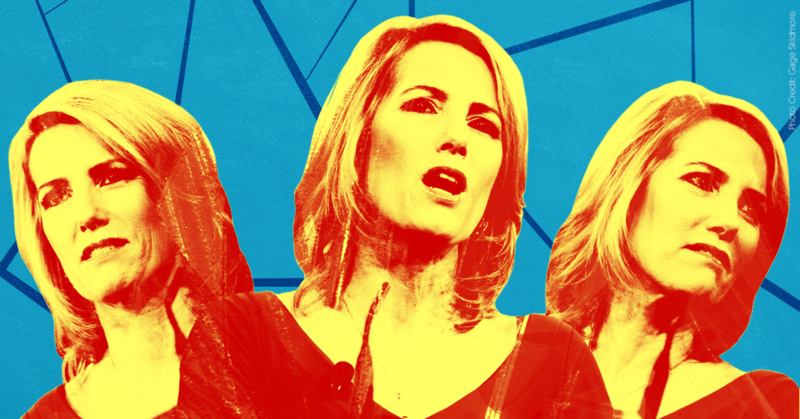 Ingraham has a history of making other racist and anti-Semitic comments, as well as disparaging organizations that serve minority communities. She said that she “would’ve prefered Madea doing political commentary” instead of Rep. Maxine Waters (D-CA). On her Fox show, Ingraham praised Confederate Gen. Robert E. Lee as a “truly great” man, and on Fox & Friends, she decried the destruction of a Confederate statue. During an appearance on Fox & Friends, she accused the NAACP of “becom[ing] a push organization for racist sentiments in many ways." Again on Fox & Friends, Ingraham claimed that terrorism is “the price ... to pay for multiculturalism." Ingraham called activist group Black Lives Matter “a complete fraud” and said they didn’t care about Black-on-Black crime. She contended that “affirmative action is "shafting people who are not of the appropriate color, or background, or ethnicity." She attacked Univision and Telemundo as “toxic," "Hispanic-centric outlets," that "revile the American experience." Rush Limbaugh: LeBron James and NFL athletes who kneel are "spoiled brats being used as political tools by left-wing activists"
Fox segment dismisses racial justice protests, guest claims "there is nothing worse than being called a racist"
As part of a partnership with the American Petroleum Institute (API), the largest oil and gas lobbying organization in the U.S., Black and Hispanic business groups have been placing op-eds in local newspapers touting the benefits of offshore drilling, as Reuters recently reported. Black and Hispanic Americans are more likely to be opposed to offshore drilling than white Americans, according to a Pew poll conducted in January. The op-ed campaign is part of an industry-driven effort to make offshore drilling look more broadly supported and to shift minority opinion by enlisting groups that purport to represent communities of color. 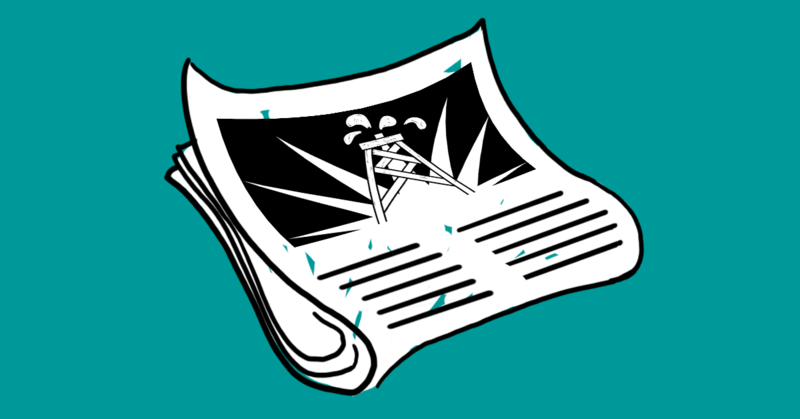 Media Matters identified six newspapers in the Southeast that have published op-eds by minority business leaders or political leaders who argue in favor of increased offshore oil and gas drilling along the Atlantic Coast. Most of these minority authors are affiliated with the Explore Offshore alliance, which they mention in their pieces -- but they neglect to disclose that Explore Offshore is a project of API and that many of the talking points and statistics they cite in their op-eds come straight from API materials. API announced the Explore Offshore alliance on June 6, billing it as a “bipartisan coalition representing a diverse group of community organizations, businesses, and local associations across the Southeast that support safe and responsible expanded U.S. access to oil and natural gas through advanced technologies.” The minority business groups in the coalition are highlighted on the Explore Offshore homepage, while most other coalition members are listed in less prominent places on the website -- an indication that API wants to highlight Black and Hispanic participation. The minority groups in the coalition include the Florida Black Chamber of Commerce, the Florida State Hispanic Chamber of Commerce, the North Carolina Hispanic Chamber of Commerce, the South Carolina African American Chamber of Commerce, and the Virginia Hispanic Chamber of Commerce, plus one minority religious organization, the Hispanic Pastors Association. In Florida, The Palm Beach Post and the Tallahassee Democrat published a pro-drilling op-ed written by Julio Fuentes, president and CEO of the Florida State Hispanic Chamber of Commerce. The Tampa Bay Times published a like-minded op-ed co-authored by Miriam Ramirez, a former member of Puerto Rico’s Senate and a co-chair of Explore Offshore Florida, a state affiliate of API's national Explore Offshore coalition. Continued offshore development would put more than 56,000 Floridians to work and add $4.5 billion per year to our economy. Employment in Florida due to spending by the Eastern Gulf offshore oil and natural gas industry is projected to reach over 56,000 jobs. Contributions to Florida’s state economy due to spending on Eastern Gulf [Outer Continental Shelf] oil and natural gas exploration and development activities could be nearly $4.5 billion per year by the end of the forecast period. Economic studies show that the industry’s spending would bring Florida $1.3 billion per year in government revenue within 20 years of opening up the area for oil and natural gas development. Florida could see a 37.5% share of the Eastern Coast bonuses, rents and royalties generated which are projected to reach $1.3 billion per year within 20 years. The Florida State Hispanic Chamber of Commerce, which Fuentes runs, receives support from Duke Energy and Florida Power & Light, two large utilities that are building natural gas-fired plants in Florida. The chamber and the two utilities have backed anti-environment campaigns in the past. In 2016, the Florida State Hispanic Chamber of Commerce joined Duke, Florida Power & Light, and other power companies in supporting Amendment 1, a deceptive, utility-backed ballot measure designed to restrict consumer access to rooftop solar power in Florida. The Florida State Hispanic Chamber of Commerce also receives support from Florida-based, third-party energy supplier Liberty Power, a company that recently paid a settlement to New York state for engaging in deceptive practices and is the subject of a cease-and-desist complaint filed by Connecticut’s Office of Consumer Counsel for allegedly deceiving consumers. The other Florida minority group that's part of API's Explore Offshore alliance, the Florida Black Chamber of Commerce, has fossil fuel ties as well. It is closely affiliated with the National Black Chamber of Commerce, which has received extensive funding from fossil fuel interests including ExxonMobil and Koch Industries. The National Black Chamber notoriously led minority opposition to the EPA's Clean Power Plan, which would limit pollution from power plants. Eugene Franklin, president of the Florida Black Chamber of Commerce, served on the board of directors of the National Black Chamber of Commerce. Both the Florida chamber and the national chamber supported the pro-utility Amendment 1 in 2016. The cumulative effect on the state budget from 2020-2040 is projected to be over $3.8 billion. Gilchrist has cultivated questionable alliances that many African-Americans in South Carolina would not be comfortable with. 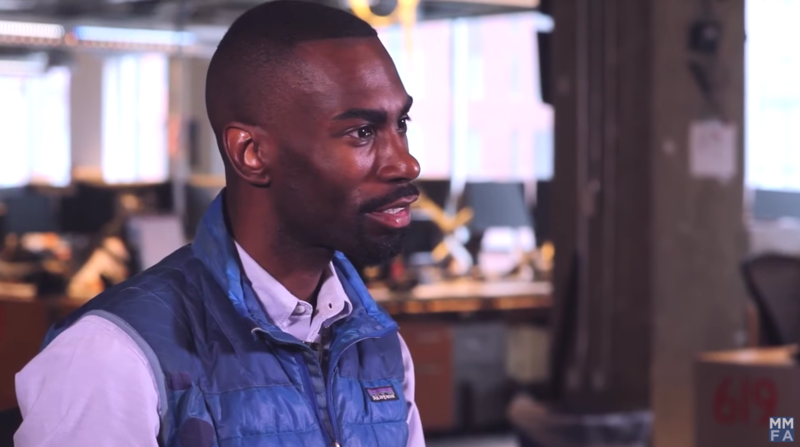 In 2015, Gilchrist invited Donald Trump to an event for Black entrepreneurs that was co-hosted by the South Carolina African American Chamber of Commerce. The crowd at the event was "predominantly white," according to The Post and Courier. In late 2017, Gilchrist invited his friend Steve Bannon, former Trump advisor and white nationalist sympathizer, to a minority business roundtable sponsored by his group. The average salary for oil and natural gas exploration and development jobs is $116,000. The Virginia Hispanic Chamber of Commerce, which is part of API's Explore Offshore coalition, joined a number of oil and gas trade associations in signing a letter to the Bureau of Ocean Energy Management urging the agency to allow more offshore drilling. The Virginia Hispanic chamber has also partnered with Dominion Energy, Virginia’s largest and most powerful utility. API is mimicking a well-worn strategy in which polluters target minority and low-income communities with industry-funded research and disinformation about energy. For example, in recent years, Americans for Prosperity, the American Legislative Exchange Council, the Edison Electric Institute, and the Heartland Institute, among many others, have waged a campaign to hinder the growth of solar energy at the state level. That effort has included the false claim, often advanced via minority politicians and front groups, that net-metering policies designed to make rooftop solar power more accessible would harm minority and low-income people. Fossil fuel industries and their allies, including the National Black Chamber of Commerce, also targeted minority groups with misinformation about the EPA’s Clean Power Plan, which, if fully implemented, would have prevented thousands of premature deaths and tens of thousands of asthma attacks each year. [M]any African American communities face an elevated risk of cancer due to air toxics emissions from natural gas development: Over 1 million African Americans live in counties that face a cancer risk above EPA’s level of concern from toxics emitted by natural gas facilities. The air in many African American communities violates air quality standards for ozone smog. Rates of asthma are relatively high in African American communities. And, as a result of ozone increases due to natural gas emissions during the summer ozone season, African American children are burdened by 138,000 asthma attacks and 101,000 lost school days each year. Blacks and Hispanics also suffer disproportionately from climate change impacts such as extreme weather. Just last year, Hurricanes Harvey and Maria devastated African-American and Latino communities in Houston and Puerto Rico. 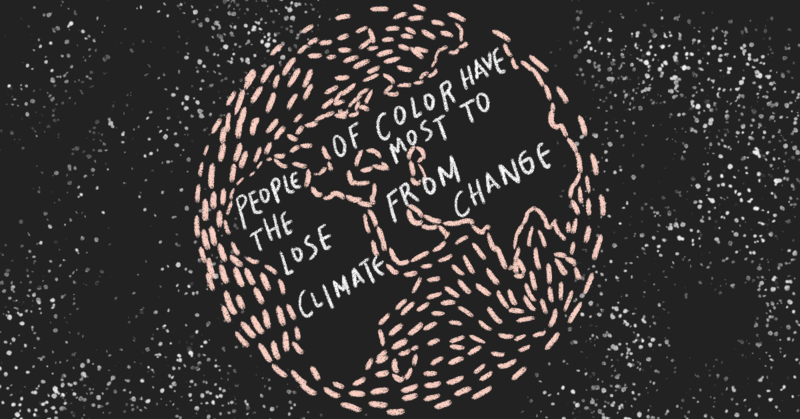 Polls have shown that nonwhite people in the U.S. are more concerned about climate change than white people are. A 2015 poll of African-Americans found that 60 percent of respondents ranked global warming as a serious issue, while a 2017 survey of Latinos found that 78 percent of respondents were worried about global warming. Surveys have also documented strong support among minority groups for clean energy solutions. A 2015 poll found that 66 percent of African-Americans believed that using more renewable energy would create new jobs, and 57 percent believed that shifting to clean energy would decrease their energy costs. A separate poll conducted in 2015 found that 84 percent of Latinos believed that the U.S. should mandate greater use of clean energy sources like solar and wind power. Clearly, minority communities understand the risks of climate change and want clean energy solutions to mitigate those risks. But API has chosen to partner with minority business groups to erode support for clean energy solutions and promote pro-fossil fuel arguments that would harm the very communities these organizations purport to represent. And, in a decision that demonstrates just how out of touch Explore Offshore is with minority communities, API recruited former Sen. Jim Webb (D-VA), a confederate apologist, to be a national co-chair. Newspapers in the Southeast and around the country should not be letting oil industry allies spread propaganda and claim to represent minority interests. Op-eds that more accurately represent Black and Latino aspirations would point out that these communities have the most to lose from expanded offshore drilling and the most to gain from a shift to clean energy.